The history of houses is something we don’t usually think about, but a lot of the time it dictates berthing about our lives. If we were today say for instance the worst economic crisis in the Great Depression was caused as a result of our homes, you’d call us mad. However if we take a revisionist approach we can see how homes in America led to the infamous Great Depression. Houses also have the power to take us out of that economic slump and allow us to live a little prosperous like in the ‘affluent 50’s and the start of what came known as ‘Levittowns’. Great Depression is something we normally associate with writers like Steinbeck and stock prices falling but people often forgot about houses. After a slight recession in America post WWI, the Federal Reserve slashed interest rates, setting off a housing bubble of such an incredible scale, larger than the one in which we witnessed in the previous decade. We see a U-shaped graph when we look at interest rates in the 1920’s falling to as low as 3% in 1925. When the prices remained low so did more investment in the real estate, it was almost too easy to get a mortgage for your house. The quantity of housing starts was double than what it was in the previous decade in America. By the endo the 1920’s a lot of this investment as the price of houses soared becoming unaffordable and making peoples investment in to real estate a large failure. The fact that 1000’s of banks closed as a result of the Great Depression shows how the excessive investment in mortgages in the 1920’s was hardly a success. This is only one way in which hoes and houses are responsible for the Great Depression, where 33% of the country were unemployed. The 1920’s was when credit was introduced and the Republican government only wanted people to spend more. In 1924, Calvin Coolidge introduced protective subsidies to allow for people to produce more. People as well as that bought more. IT was the start of credit and $6 billion worth of goods was purchased by credit in this decade alone. Lot of a lot these luxurious items purchased was for people renovating their new homes. For example the number of radios in houses quadrupled in this decade as people would buy more for their homes. This included fridges, decorations, furniture. However once you buy a radio, you don’t need another one. Spending for homes eventually went down as people got what they needed. How many people need to buy more than one fridge? As people stop spending the values of companies went down, as they made less profit. As they made less profit, people had to become redundant. As they lost their jobs they couldn’t afford to pay their mortgages and led to their houses being repossessed. As we can see, the Great Depression is one massive cycle and we can largely see how property and careless spending made it happen. 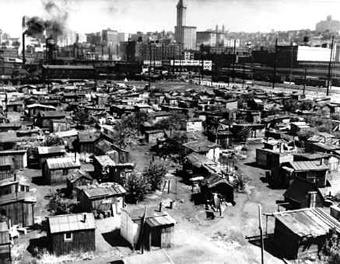 People then had to move into ‘Hooverville’s’, named after President Hoover in 1929, which were similar to slums. By 1932 11m were unemployed and Steinbeck found his inspiration of writing. Which was homeless men in America travelling to look for work. Billy the House Doctor sees this as how fundamental housing is the world and how we need the price of houses to remain stable and also our spending within our homes to be consistent, which is at the sort of stage we are at today. However, we are currently at a stage where our interest’s rates are low in the UK and it is inevitable for them to go up again. The only advice we can give only all people to buy property is to be cautious in their buying choice; to remember your house value will always change every year and that you do not want to end up in a ‘Hooverville’.